The UINL (Union Internationale du Notariat, International Union of Notaries) is a non-governmental organisation established to promote, co-ordinate and develop the duties and activities of Notaries throughout the world and ensure the standing and independence necessary for optimum service to individuals and society through close collaboration between Chambers of Notaries. It was founded in 1948 by the representatives of the Chambers of Notaries of the following nineteen countries: Argentina, Belgium, Bolivia, Brazil, Canada, Colombia, Costa Rica, Cuba, Chile, Ecuador, France, Italy, Mexico, Paraguay, Peru, Puerto Rico, Spain, Switzerland and Uruguay. The original statutes, approved in the form of a "Charter" in October 1948 in what was known as the International Congress of Latin Notaries and idea that emerfged mainly from Argentinian Notary José Negri the idea was performed and became reality, with the help of Spanish Notary Rafael Nuñez Lagos. The statutes were officially adopted by the Congress held in Madrid on 21st October 1950. Organisations which are not part of the notarial system in order to collaborate with them in areas of common interest. - in various international non-governmental organisations, such as the International Union of Lawyers (Union internationale des avocats UIA), the International Union of Judges (UIM), the International Law Association (ILA), the International Bar Association (IBA). 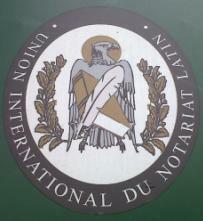 The Union Internationale du Notariat was previously known as the Union internationale du Notariat Latin. Its main office is the Secrétariat Administratif de l'Union Internationale du Notariat, located in Rome, Italy. For additional information go to: UINL (official website). The flag was first spotted on March 24, 2012 and can be seen here. (0:27, the flag is the third flag froml left to right). The flag is a white horizontal flag featuring the coat of arms in color. The coat of arms's motto is: "lex est cuodqumque notamus". However there's a variant of the coat of arms, which I spotted on Medellín, Colombia, outside a Notary office affiliated to the UINL. Variant colored coat of arms of the UINL seen in Medellín, Colombia.